Tatooine is the primary planet in the Tatoo system, this desert world was located in the Arkanis Sector of the Outer Rim Territories near Piroket and Ryloth, some 43,000 light-years from the galactic core. It was close enough to a major hyperspace nexus to make it easy to get to such worlds as Coruscant and Corellia, but its environment made it one of the most inhosptiable places in the galaxy. Tatooine's silicate surface reflects the light of its suns so intensely that legends tell of its original explorers first mistaking the planet as a third, smaller sun. Also in the system is a pair of uninhabited gas giants, Adriana and Ohann. The first settlers of the planet -- called "oldsters" in local folklore -- sought to turn a profit by exploiting the ore found beneath the sands. The magnetic ore was soon discovered to have undesirable metallurgic properties. The weary miners and investors abandoned their failed mines and equipment, looking to distance themselves from this Core-forsaken world. Not all could afford to leave. Those that stayed behind turned to moisture farming and trading to survive. When the Hutts came to Tatooine, so too did their wealth and illicit business. Tatooine was given newfound life as a trading post and backdrop for Hutt commerce. 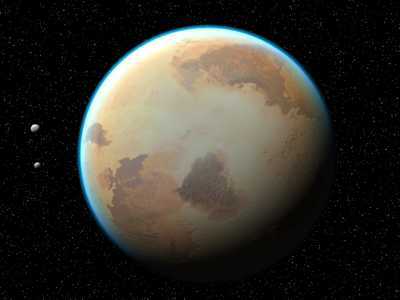 A combination of magnetic ore desposits, twin stellar radiation, and prevailing wind patterns has made one patch of Tatooine's surface more habitable than neighboring areas. It is this zone -- where temperatures rarely exceed 43 degrees standard -- that is home to most of Tatooine's population centers. The official capital of Tatooine is Bestine, located some 200 kilometers west of Mos Eisley. Other communities include Mos Espa, Motesta, Wayfar, Anchorhead, Arnthout, Mos Taike and Mos Entha. At a young age, Anakin Skywalker was brought to Tatooine as a slave, and toiled away in Mos Espa before being discovered by Jedi Master Qui-Gon Jinn. A generation later, Anakin's son, Luke Skywalker, grew up on the Lars homestead moisture farm.